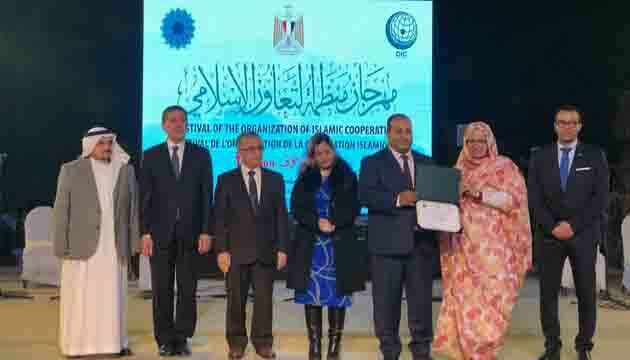 “One nation, diverse cultures … Palestine in our heart”… is the starting words of first edition of the OIC Festival .Over five days (5-9 February, 2019), the Egyptian capital, Cairo witnessed the atmosphere of intermingling between the different cultures of the peoples of the Islamic countries, and the spirit of solidarity and love prevailed, with the insistence on moving towards a bright future of the Islamic Ummah, waiting to see what the components of the Islamic peoples will reveal as a rich heritage that deserves to be explored and dazzled by the world. At the closing ceremony held at the North Cairo Wall Theater, everyone gathered here on the success of the idea of the festival and looked forward to its continuation and to be the icon of the Organization of Islamic Cooperation in bringing together the peoples of the Islamic world. The Secretary general affirmed that the success of the first edition of the festival did not come from a vacuum. Egypt, the Government, the leadership and the people have done their utmost to ease the establishment of all cultural, artistic, sport, literary, poetic and political events in different locations in Cairo. Egypt has shown hospitality and welcomed delegations from more than 20 countries. Spread their creations to the peoples of the Islamic world and the world at large. Dr. Al-Othaimeen also expressed his gratitude the Government of the OIC hosting country, Kingdom of Saudi Arabia, under the leadership of the Custodian of the Two Holy Mosques King Salman bin Abdul Aziz and His Highness the Crown Prince, Mohammed bin Salman bin Abdul Aziz, may Allah protect them, for their continued support to the initiatives of the organization and its activities, and their generous contribution to the success of this festival. “I am happy with the interaction of the OIC member states with the idea of the festival and their conviction that we can send a message to the world that Islam is against extremism, violence and terrorism and does not conflict with culture, arts, literature, folklore and other peoples’ heritage,” he said. In this respect, we are promoting the popular diplomacy or a communication between peoples. The response of the Republic of Egypt during the meeting of the Council of Foreign Ministers (forty-fifth) in Dhaka, Republic of Bangladesh, constituted the first stimulus bringing the number of countries wishing to host the festival to ten, namely Saudi Arabia, Azerbaijan, Sierra Leone and other countries, while the second session of the festival will be held in Abu Dhabi, United Arab Emirates. The Secretary-General also affirmed : Perhaps one of the most important things that we have brought out as we close the curtain on this festival is to affirm beyond any doubt the solid relations between our Member States and the need to continue to promote solidarity among all our peoples and nations on the basis of the unity of faith, Cultures and folklore, to convey a clear message to the whole world that diversity does not mean disagreement, and that cultural diversity is a source of strength and wealth that contributes positively to our solidarity and interdependence. The Secretary general ended his speech by saying: We hope at Islamic Cooperation Organization that the Festival, with its entire intellectual, cultural, political, humanitarian, heritage, social activies, constitutes a new start of a better joint Islamic action between our Member States, and a tool of intellectual creativity in which we emphasize our common values and brotherhood among human beings.